Boot Camp An instructor led high intensity water aerobics class. Independent Exercise This program is for adults who want to walk or do their own exercises in the swimming pool without an instructor. Lap Swimming Lap swimming is a program designed for those capable of swimming at least 25 yards nonstop without assistance, swimming or kicking up and down the length of the pool. Lap swimmers may be asked to share a lane, or swim in a circle or traffic pattern, to accommodate 3 or more swimmers in a lane. Lessons Group Swimming lessons are offered at various time throughout the year, and require pre-registration. Please call to check with pool staff for date and times of those classes. Private lessons are offered year round but do depend on the availability of instructors. All lessons can be arranged by calling the pool and asking for Jessica. Parent Tot Parent Tot is a time for guardians and their children 6 and UNDER to utilize the shallow area of our activity pool. These are not instructor led classes. 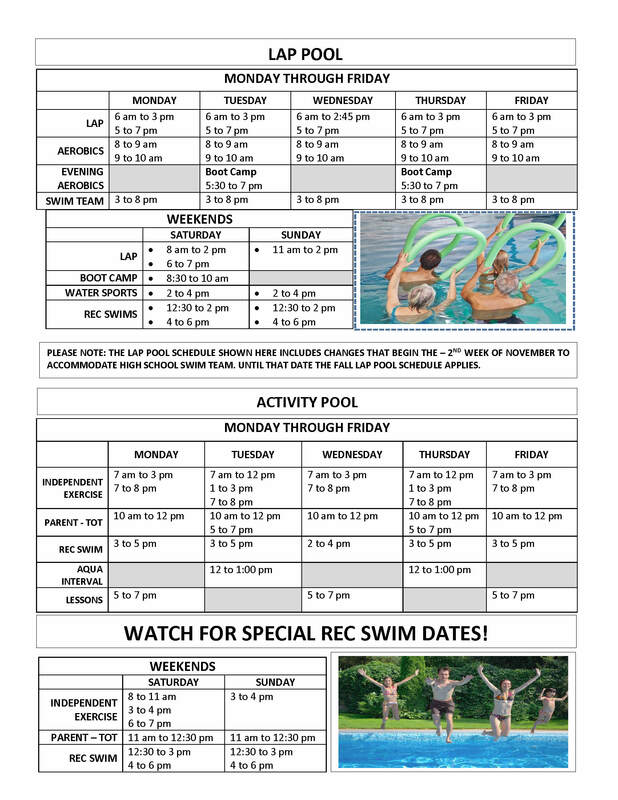 Recreational Swim Open, recreational swimming is for all ages, however CHILDREN 6 and under MUST BE ACCOMPANIED IN THE WATER BY AN OLDER SWIMMER 16 AND OVER. Swim Team Swim Team is a membership based program for youth, 5 to 18 years old. 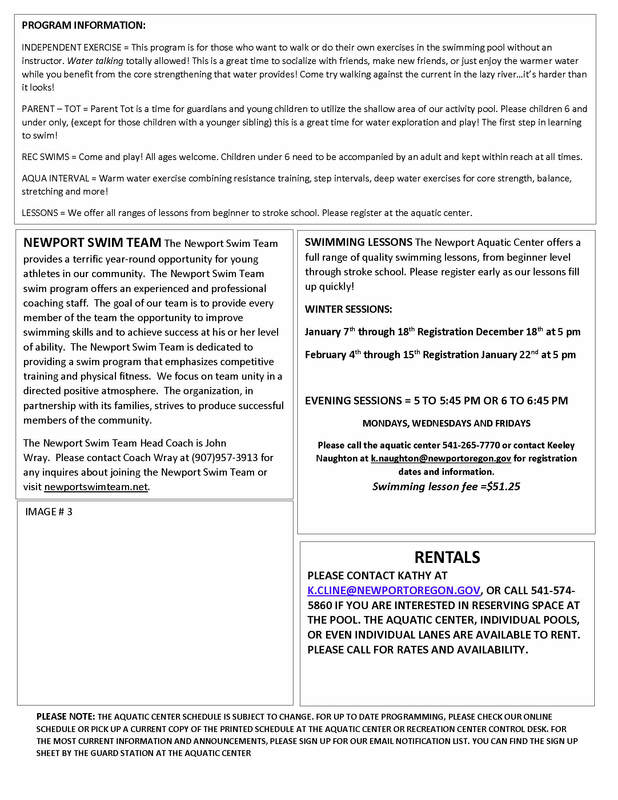 Registration is through the Newport Swim Team. Water Exercise Water Exercise is an INSTRUCTOR LED class, for adults or older children who can follow along with an instructor. Water Sports The pool can be utilized by those that wish to practice scuba or kayaking, play some underwater hockey, or other water based sports and activities. All equipment needs to be approved by pool staff. Water Walking Water Walking is another time that guests can utilize the activity pool for walking or light exercise. This is not an instructor led class. Please note: we reserve the right to change or cancel any part of the pool or facility schedule with limited notice.